This ring features a large round brilliant gem in a three stone setting accented with two smaller round brilliants on the sides and pave around the shank. Select the gems of metals of your choice to create custom contemporary engagement rings with this design. Engrave A Message - Engraving is FREE! Our gems are cut in the size and dimensions as we state. One-carat gem will always be one-carat gem. Proper symmetry and proportions directly result in a more visually appealing gem. The surface of every facet is clear and crisp leaving you with only a mirror like finish and sharp edges. 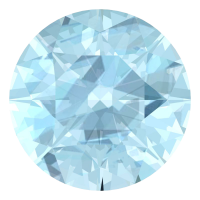 The position and shape of the facets are consistent around the gem showing off our immense attention to detail. Well-cut gems have ideal proportions to optimize brilliance and sparkle. Our gems are not cut maximize rough yield. Each gem is inspected at least 7 times during the cutting process. We use only the world's highest quality materials to create your gems. Every ring is made with precision and care to ensure it lasts generations. Each gem is hand-selected to create a set with matching colors and cuts. We only source conflict-free materials to create our gems. Many gems are cut in our family workshop leaving out middlemen of the industry. We donate a portion of each purchase to Jewelers for Children. We are proud of the quality of our products and are confident that you will be too. The tranquil light blues of aquamarine have been found in jewelry as early as 500 B.C. It requires no special care and is an excellent stone for everyday wear. This versatile metal compliments any gemstone, as it’s becoming an increasingly popular choice in fine jewelry. The white gold also gives you the look and feel of platinum with more flexibility in your budget. What Happens when you hit Purchase? The caster receives a request to produce your ring in the metal and size that you have selected. We hand select your stones and match them according to the layout of the design. The bench jeweler sets the stones, removes any excess metal, and polish the ring. We examine the completed ring to ensure it is nothing short of excellence. Our team packages your ring in a premium gift box and sends it out via complementary insured shipping. The way the gems and design compliment each other is so cool. You can really tell that there is a lot of care and attention to detail in this ring. I would buy the Three Stone Pave Zasti Ring all over again if I could. So many brightly colored gems! I can't get enough of my Zasti Ring. The pink tourmaline, citrine, and peridot combination on white gold is dazzling! Cool gems made by cool people. Love the amount of work and education they give for their products. Makes me feel like I know much more about what I'm buying. The three stone pave zasti ring is amazing and wortht the money once you know where it comes from. All orders, returns, and resizings are insured and shipped through FedEx and UPS. Tracking information is also provided. Orders can be returned within 30 days with free isured return shipping. Most of our rings come with an option to engrave up to 15 letters. Ordes can be resized for free within 30 days of purchase with free insured shipping both ways. As we stand by our commitment to quality, we offer a lifetime warranty with every piece. We can help you create the perfect piece. Whether it's your own sketch or inspirations from existing styles, we invite you to share your ideas to design a custom ring. Click the button below and follow the steps to create your own unique piece.